If you have to dress a dragon, you must be prepared to catch him as he flies by. Also, beware of ticklish toes, shirts with buttons, and hats that do not fit neatly between his horns! 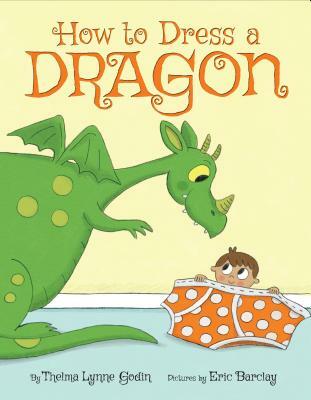 In this charming, second-person narrative, our little boy hero imparts his infinite knowledge of how to dress a dragon, a task that isn't quite as easy as it may seem. With helpful hints like, You may have to tickle-tackle him to the floor and give him belly kisses, and warnings like, Dragons do not like shirts. But they do like capes ! this story is not only delightfully entertaining, but extremely endearing. Author Thelma Lynne Godin and illustrator Eric Barclay come together perfectly to bring this fantasy to life! Thelma Lynne Godin grew up in Sault Ste. Marie, Michigan. As a child she loved reading, chasing fireflies and swimming in Lake Superior. As an adult she has worked as a social worker and a librarian, but her favorite job is writing for children because it allows her to use her vivid imagination to create whimsical stories. Godin lives on the shores of Lake Superior in Michigan's Upper Peninsula with her husband. She has two grown children and four grandchildren. She is the author of The Hula Hoopin' Queen which Kirkus Reviews called "a lively, intergenerational story" in a starred review.